Credit goes to Richard (rkrenn) for posting the original information. When the 4/3rds system was first introduced, cameras had descrete connectors for USB, video and shutter release (remote cable release). The E-1 and E-300 have these separate connectors. Note: The E-300 remote cable release connector is located on the optional HLD-3 vertical grip. 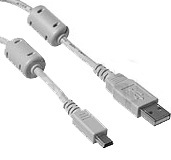 Beginning in 2006, Olympus switched to a multi connector which combined some of these features into a single 12-pin connector. Its features evolved and not all cameras support all of the features. For example, the shutter release feature was not added until later and camera models with early multi connectors like the E-500 and E-330 have no support for a shutter release. 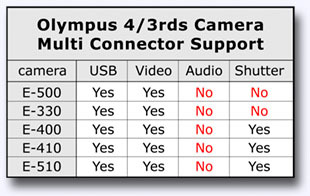 The following table lists the 4/3rds cameras that use the multi connector and which features they support. You'll also notice that none of the 4/3rds cameras support the "Audio" feature. At present, it is supported only by Olympus' point and shoot (P&S) cameras because they can shoot mpeg movies with sound. Some readers may also wonder if this information applies to the Panasonic DMC-L1 or Leica Digilux 3. The answer is "no". They do not use the Olympus multi connector. But this scheme has a flaw: Since all of these cables must use the same multi connector, you can't use all of the features at the same time. In other words, if you plug in the RM-UC1 remote cable release so you can activate your camera's shutter while it is mounted on a tripod, then you won't be able to use the CB-VC2 video cable to monitor images on a remote monitor. And there are other combinations that will also be impossible. The most universal cable is the USB AV/PC-2 which allows you to use both the USB and video connections at the same time. 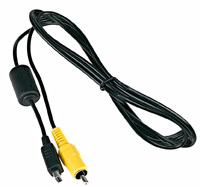 If you use this cable, you'll have to ignore the audio cable because none of the 4/3rds cameras support audio (yet). 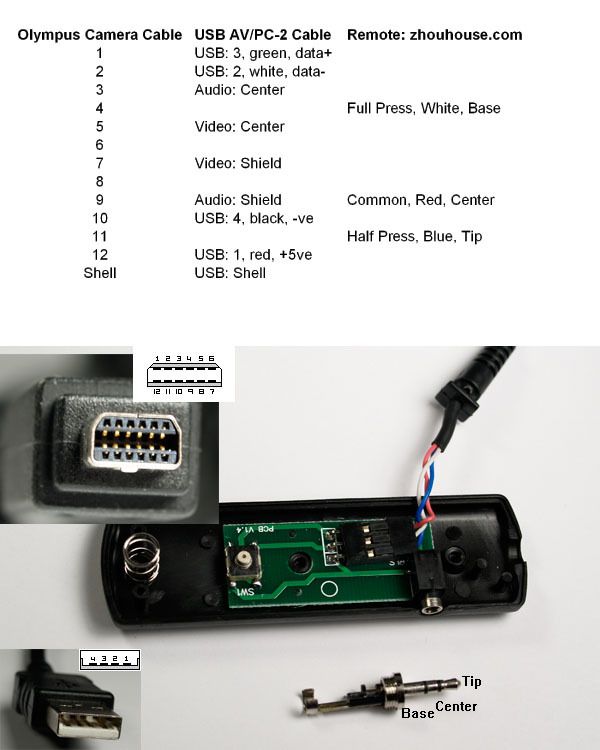 The reason the USB AV/PC-2 has an audio output is because it is used with the P&S cameras which incorporate audio into the multi connector along with the other functions. The only solution to use some combinations of functions at the same time may be to make your own custom cable. To do so you'll need to acquire a 12-pin plug that fits the multi connector. You'll also need to know how to wire it. We can help with the latter. 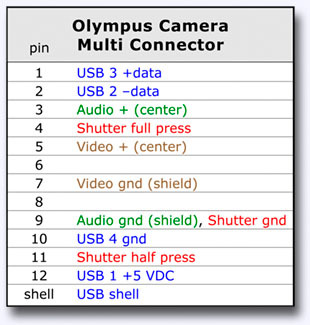 The following chart lists the pin assignments for the Olympus multi connector. Remember, that the 4/3rds cameras do not support the audio function so you can ignore pins 3 and 9. Plus, the E-500 and E-330 do not support the shutter release (remote cable release) function which means you can ignore pins 4, 9 and 11. This information above was determined by inspecting an Olympus AV/PC-2 cable and a Jin Jia Chen (JJC) MR-J remote cable release. The illustration below was posted in the original thread by Richard (rkrenn) and you may find it useful. The partially disassembled remote cable release in the middle is the JJC MR-J remote cable release (a Chinese-made third-party product). We hope you find this information helpful. Important: If you decide to make your own cable and damage your camera in the process---it is your responsibility. We do not guarantee the information in this post. is there a wired shutter release for the 500?